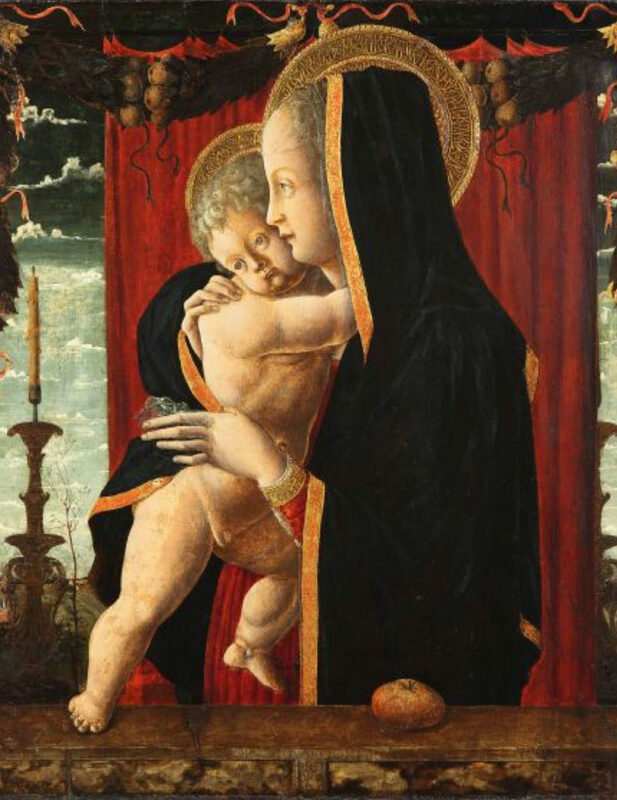 Mantegna joined the workshop of his master Francesco Squarcione in Padua when he was very young. In this northern Italian city he not only discovered the works of contemporary artists such as Donatello, but also the art of antiquity, thanks to the large collection of casts of works of classical antiquity that Squarcione possessed. The foundations of Mantegna’s artistic career were laid in Padua. 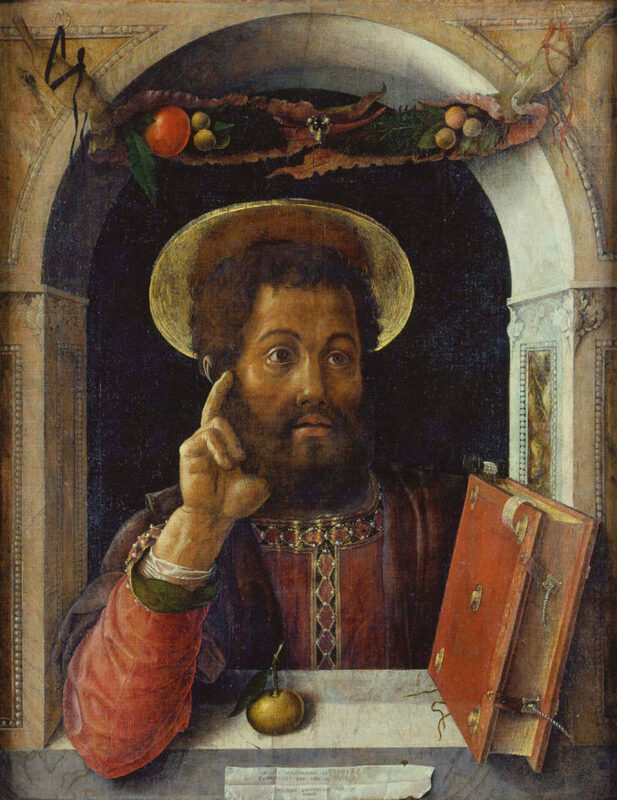 The depiction of Saint Mark is one of the earliest known works by Mantegna from Padua. The architectonic window opening functions at the same time as a frame within the picture, out of which the evangelist turns to the observer. 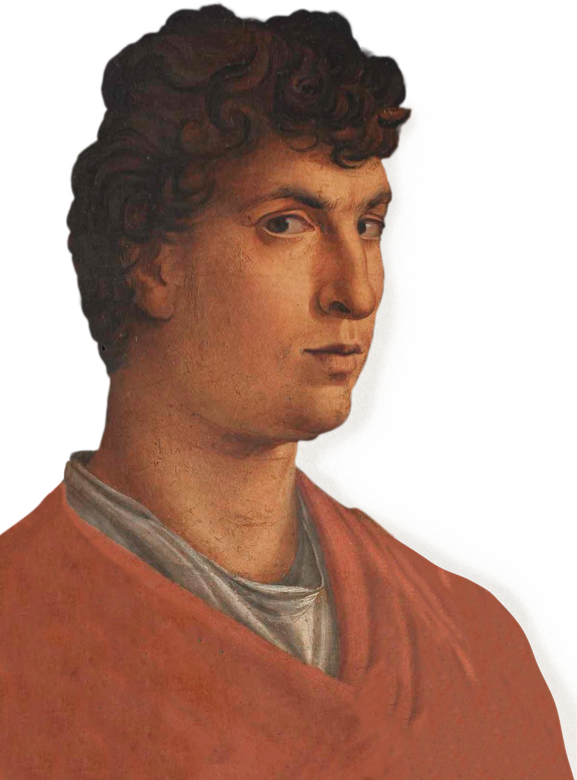 It was common for talented young disciples, such as Andrea Mantegna, to be adopted by their masters. But after only a few years the young Mantegna surpassed his master Squarcione and did not hesitate to embark on his own independent artistic path. 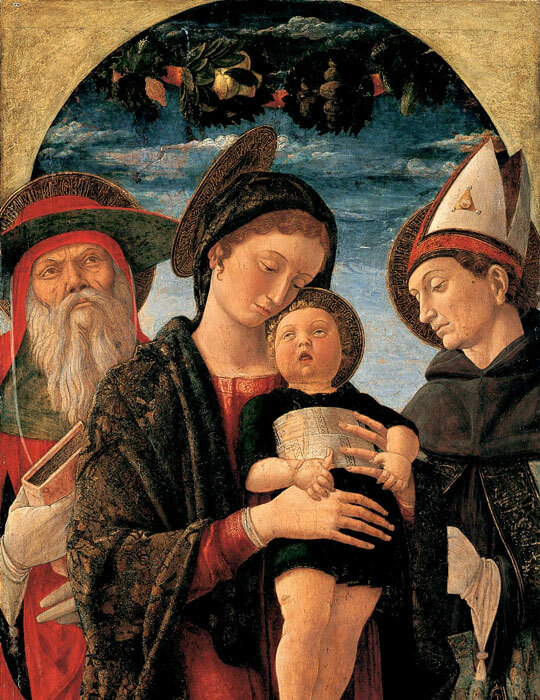 Giovanni Bellini was born into a Venetian family of artists. Together with his father Jacopo and his brother Gentile he worked in a large workshop for numerous clients from Venice’s elites. The two books of drawings by Jacopo (today in the Louvre, Paris and the British Museum, London) reveal some of the compositional ideas of the Bellini family, which found their way into Giovanni’s as well as Andrea Mantegna’s works. 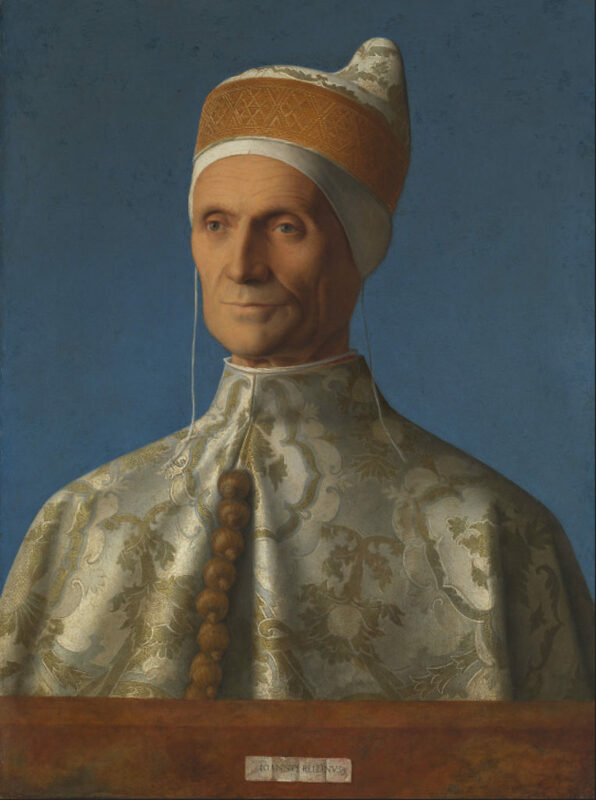 This portrait of the doge Leonardo Loredan was painted by Giovanni Bellini when the doge took office in 1501. 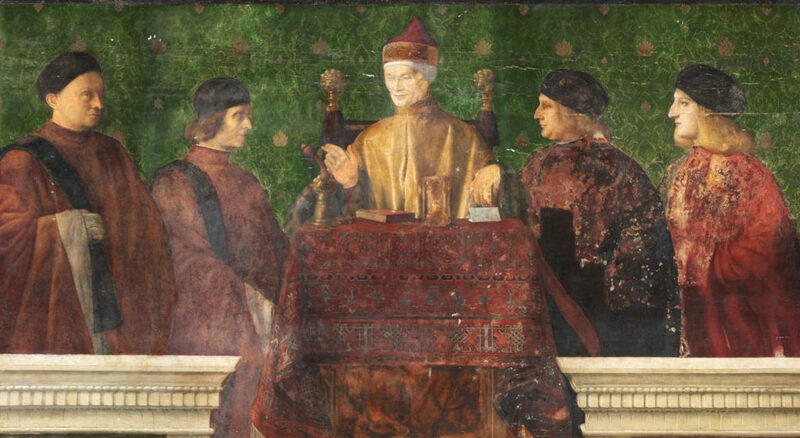 It depicts the head of state of Venice in a three-quarter view, wearing the doge’s cap and a luxurious robe of state of damask. 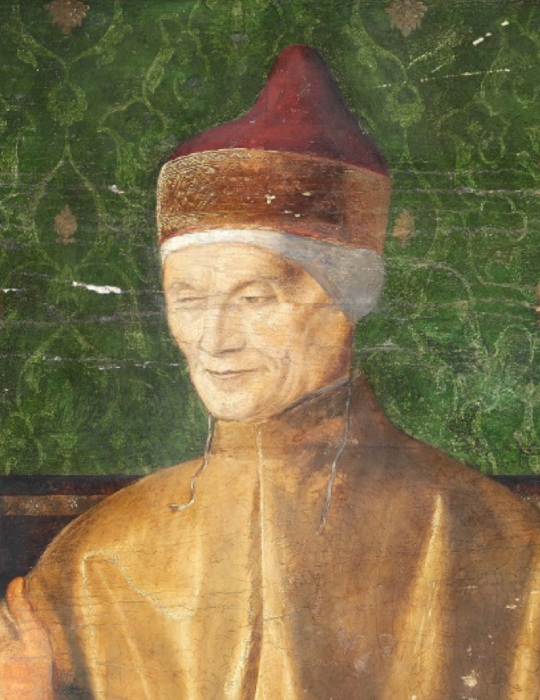 The Gemäldegalerie of the Staatlichen Museen zu Berlin also possesses a portrait of the doge Leonardo Loredan with his four sons, dated 1507 and signed by Giovanni Bellini. The over two-meter wide panel once served as a room decoration and was severely damaged over the centuries by climate conditions and overpainting. The original quality of the painting is thus difficult to appreciate today. Conservators examined the painting, looking into which parts can still be considered “original”, and which were painted over as part of the artist’s own painting process. 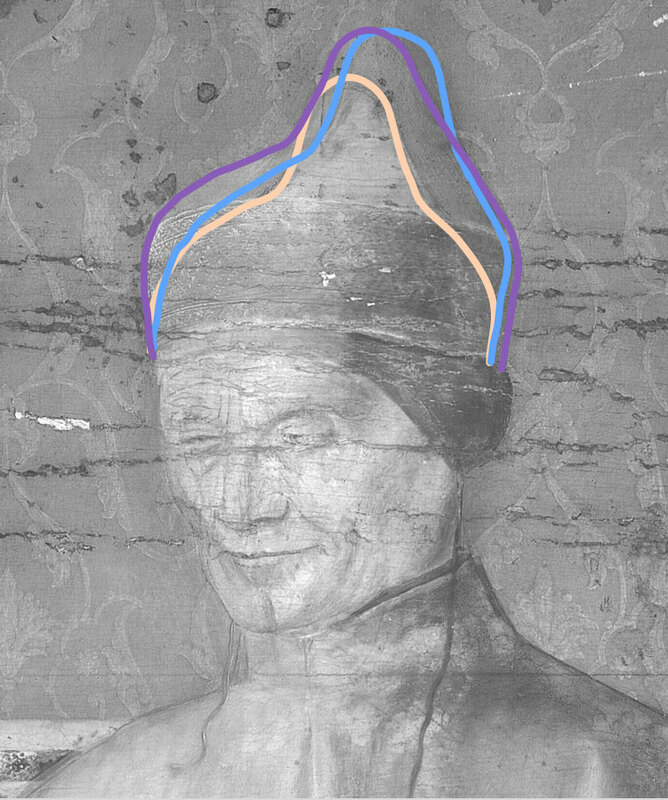 For example, an infrared reflectogram has shown that Bellini initially began to paint the doge’s head in somewhat smaller dimensions, apparently painting over a tracing derived from a paper sketch. Underdrawing of a small cap without brim, contoured with green background paint. Enlargement of the cap and shifting of the tip towards the right. Final state, the cap is enlarged extensively, clearly extending over the background paint. 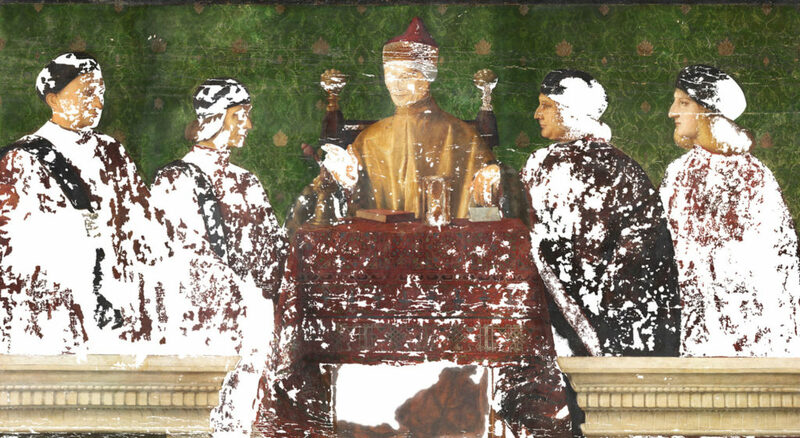 In the current state of the painting several spots of overpainting on the gowns of Loredan’s accompanying figures have been partially removed, other damaged zones have been carefully retouched. The marking of areas in white that no longer belong to the original distinctly indicates how much of Bellini’s painting has been lost. This mapping is an important basis for deciding the subsequent restoration steps. Is it a Mantegna or a Bellini?